Have you ever considered growing your own vegetable garden? It is a fun, inexpensive, rewarding and relaxing outdoor activity. And you’ll have your own healthy organic vegetables and herbs with regular supply the whole year! Many people might think it’s not possible to grow enough food on limited space. But when you check out what the Dervaes family do, you will have a different opinion. The Dervaes family live in Los Angeles in a tenth of an acre, just 15 minutes away from downtown Los Angeles. 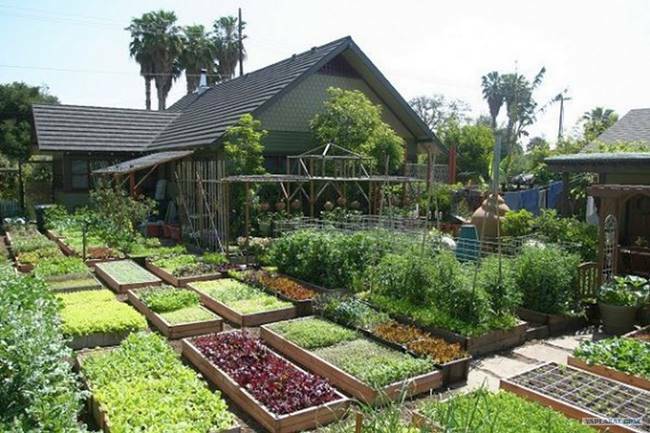 The size of land itself is typical for a home in a big city, but what’s amazing is that they build an independent and sustainable farm which can grow mover than 6000 pounds of food per year! They grow over 400 species of plants, 4300 pounds of veggies, 900 chicken eggs, 1000 duck eggs, 25 pounds of honey, and seasonal fruits throughout the year. They pretty much have everything they need to live a healthy life. Actually it’s more then what they need. They even make more than $20,000 a year by selling their extra food. Awesome! If they are able to grow enough fruits and vegetables from such a small space, you can also do it. Check out their story in the following video…Enjoy! Don’t forget to share this amazing story with your friends and family!